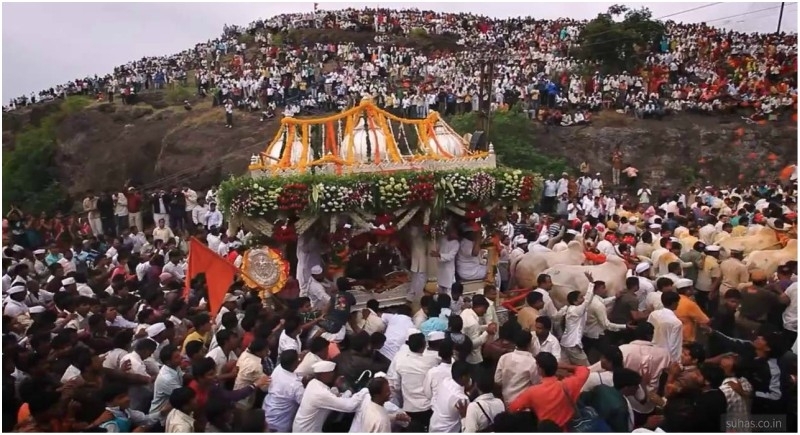 Pune, July 5: Maharashtra's 700 years old tradition, "Pandharichi Wari" in which devotees of Lord Vitthala called Varkari trace the route to Pandharpur. Wari for this year will resume from today. For this holy function Devotees from all over state gathers in Dehu and Alandi, the native places of Sant Tukaram Maharaj and Sant Dnyaneshvar Maharaj in Pune district and the procession starts for its final destination, Pandharpur. Like every year, thousands of warkaris will trace WARI route from Dehu and Alandi to Pandharpur. Chants of Vitthal Vitthal Jay Hari Vitthal will resonate in the air next 20 days when Wari will resume from Dehu this evening. Thousands of devotees have already gathered in Dehu for Sant Tukaram Palakhi program. Sant Dnyaneshvar Palkhi will resume on July 6 from Alandi. Pune district administration has made all the facilities available for warkaries. Both the processions will take a halt in Pune city on 8th July. Pune Municipal Corporation is ready to welcome both the procession. Local transport buses are doubled for the convenience of devotees. Girish Bapat, guardian minister of Pune has appealed people to maintain hygiene and make this Wari "Nirmal Wari".The Palkhi procession will reach its destination on 22nd of July for next days Ashadhi Ekadashi celebration.